The Mills resistor is a non-magnetic, non-inductive, and wire-wound that was specifically designed for high-end electronics, loudspeakers, and audiophile upgrades. The all weld axial construction boasts an Alumina ceramic core with a Cuprum or Ni-Chrome element, Silver plated Copper alloy end-caps, and tinned Copper leads. Aryton-Perry winding greatly reduces inductive reactance, signal loss, and allows a Cuprum element to be used up to four times the value of most. 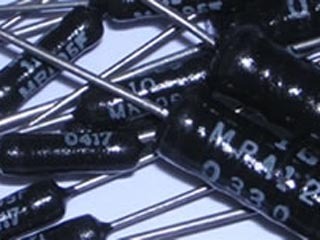 The Mills MRA resistors exceed MIL-R-26E specs, and satisfy MIL-STD-202, method 106, 208, and 218. All resistor values are 1% tolerance. The MRA-10 (10 watt power rating) will handle overloads 10X its power rating (100 watts) for 5 seconds with operating voltages up to 1000V. The body measures .875" ± 0.062" in length by 0.312" ± 0.031" in diameter. The leads measure 1.500" in length minimum by 0.040" in diameter. "All" of our "Mills" inventory is NOS, and made in the USA. This includes all of the following finishes: powdery Black, powdery Brown, gloss Black, and gloss Brown. Some MRAs may even be marked with their previous designation "MRB-NI-CU". Our precision matching applies to "pairs". You may request a larger matched group, but it may not be possible. NOTE: resistors and precision matching are priced and sold individually ("each"). Occasionally, we can not find a matched pair. If this is the case, Customer Service will contact you. We offer three levels of matched pairs: L1-factory tolerance 1/2% matching; L2-1/2 factory tolerance 1/2% matching; L3-1/4 factory tolerance 1/4% matching.